Please arrive a few minutes early to allow time for registration and bring your insurance card with you. For Medicare patients, please bring your Medicare card and a secondary insurance card if you have one. New patient visits usually will last 1 hour to 1.5 hours and your eyes may be dilated. Plan to have someone drive you home if you think you won't be able to drive safely with your eyes dilated. Family members are always welcome to sit in on your exam, if you wish them there. If you wear glasses, please bring them to your appointment. In order to have the most up-to-date medical information about each patient, it would be a great help to us if you can bring a list of all your current systemic and eye medications to your initial visit. If you want to have a contact lens exam, please tell our receptionist at the time of scheduling. Please bring a copy of your contact lens prescription, contact lens box, and contact lenses with you if you have a pair. If you have a pair of back-up glasses, please bring them too. Our clinic is open from 9:00 a.m. to 5:30 p.m. on Mondays, Tuesdays, Wednesdays, and Fridays. We are open from 9:00 a.m. to 1:00 p.m. on Thursdays. If you are unable to keep an appointment, we ask that you kindly provide us with at least 24 hours notice. This courtesy on your part will make it possible to give your appointment time to another patient. Polaris Eye & Laser, Inc., features a paperless office that integrates an electronic medical record system with state-of-the-art diagnostic and therapeutic equipment. The electronic system allows for accurate record keeping and online billing, while minimizing errors due to lost charts or difficult-to-read handwriting. This technology has already improved the effectiveness and efficiency of patient care in our office. We accept most PPO insurance and Medicare assignments, but please check with your insurance company to verify if we are a participating provider for your plan. Not all medical plans cover routine vision exams (when patients have no eye complaints or when no known eye condition exists). You may have a separate vision plan that covers routine or annual eye examinations and/or glasses. We currently do not accept any vision plans. Please check with your insurance carrier regarding coverage for routine eye care. We are a participating provider under Medicare. We will file all claims to Medicare with a valid signature on file. We accept the reimbursements set by Medicare for medical and surgical services covered by the Medicare program, including surgery. If you have Medicare, you will be responsible only for co-payments, deductibles and non-covered services. Routine eye exams and refractions are not covered by Medicare and payment is requested at the time of service. Refraction is a measurement of the lens power necessary to prescribe glasses or other corrective lenses. Most medical insurance plans, including Medicare, do not cover refractions or routine eye examinations. Medicare allows us to charge patients separately for the refraction portion of the examination, since it is not a covered service. For any cost that is not covered by your plan, payment in full is expected at the time of ordering contact lenses, contact lens supplies, and for eyewear frames and optical accessories. Contact lens evaluation and contact lenses are not usually covered by medical plans. Please check with your carrier. 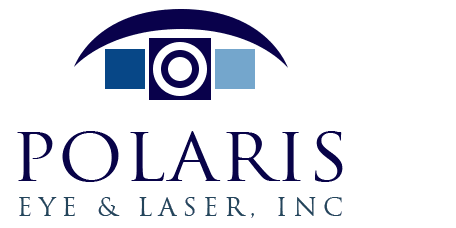 At Polaris Eye & Laser, Inc., we would like to make the financial portion of your care as affordable and convenient as possible by offering a variety of payment options.